I have quite a few projects from the third week of the course when Marie introduced various ways of adding colour to tangles. Since there are too many to post at once I thought I’d post my final piece of artwork for that week first. 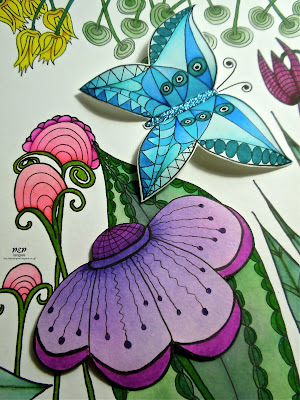 It was actually supposed to be a Zentangle Inspired scrapbook page – I adapted the exercise somewhat & started by drawing & colouring the butterfly as my focal image & then constructed the rest around it – much the same as if I’d used a photograph for the focal image. This has taken the best part of a week to draw, colour & assemble with plenty of learning experiences along the way as I’m not a person who can draw by instinct/naturally. Prior to this course I’ve not used Tombow pens & I discovered as I was initially trying to work on my favourite Winsor & Newton Cotman 190gsm Cold Pressed/NOT Grain Fin watercolour paper that the Tombows refuse to blend out smoothly when direct to paper watercolouring - a very visible hard line remains. On an earlier exercise where I’d not been shaping elements I’d used the more robust Daler-Rowney Langton 300gsm Hot Pressed Extra Smooth watercolour paper without the hard lines so I had to conclude that the different watercolour papers were having an impact upon the blendability. The thick hot pressed paper doesn’t really respond very well to a ball tool for shaping but I eventually managed to shape my butterfly & petals without creasing by gently rounding them over several sizes of glue bottles & pencils. 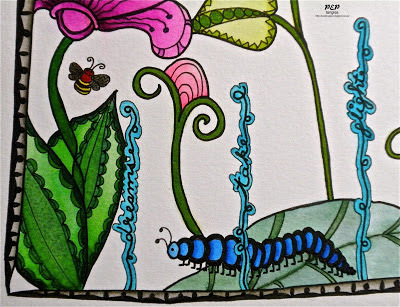 The project was drawn by hand using Sakura Pigma Micron Pens 01 & 05 onto a 9¾ x 7 inches piece of the Langton hot pressed watercolour paper & watercoloured with the Tombow markers using the direct to paper method. 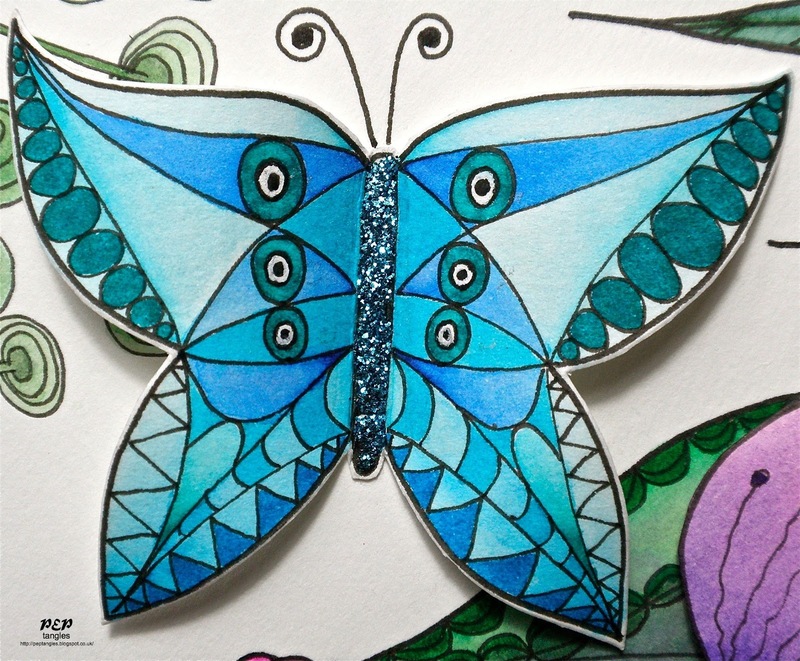 The butterfly’s body has been glittered using Stickles glitter glue & shaped as above. This one is a real treat for the eye Paula, what wonderful talent you displayed on this lovely piece. Wow Paula this is wonderful and for someone who 'doesn't draw' this is an excellent result. There are so many lovely elements in this and the colours are vibrant. I think the border just seems to finish it nicely. Great stuff!! Wow Paula, another triumph. You just go from strength to strength! It is stunning, Paula! I can see there is a huge amount of work in it, and I love it! Before I know I spend to much time behind the pc and that comes at the expense of my creative process. 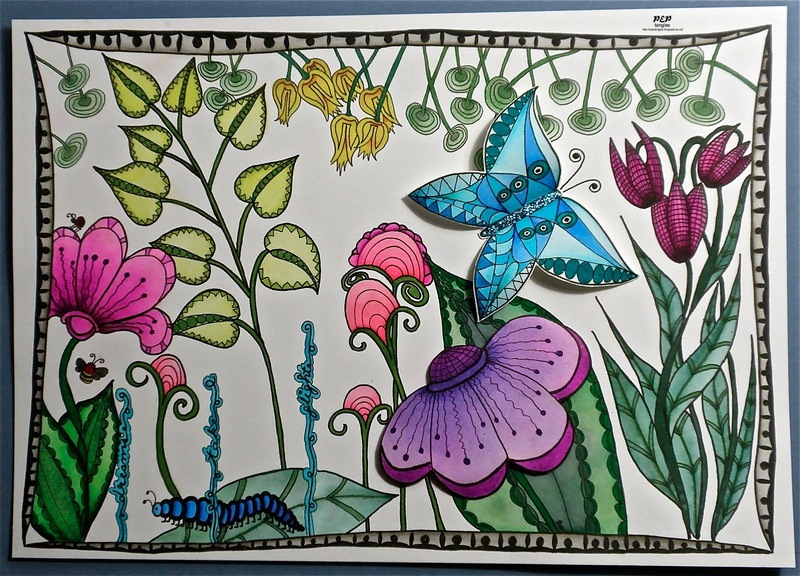 The artwork on this piece is just superb Paula, your colour shading and choice of patterns for the butterfly and those stunning flowers is gorgeous and I love the way your eye is drawn from one piece to the next, with those lovely details like the bee and caterpillar along the way. Using text to make those fronds is just brilliant and your tiny ant is great. I am sure you must have signed it somewhere but I can't spot it. A very pleasing, harmonious project , well worth all of the effort. Luv, luv, luv the vivid colors and design!! Paula your adventures in Zentangle have been heavenly to see and watch over the past several weeks. Just when I think one of your posts is my favorite, I find another stunning post to greet me. Spectacular drawing and the color is amazing! wow Paula, how fabulous is this! I love the mix of cool colours and the sparkly bits too. Pretty shapes, shades and your balance is perfect. Paula the addition of colour to your zen tangle adds a whole new dimension, this looks amazing it just bursts with life!